The client libraries provide a Push Admin API that is intended to be used on a customer’s servers to perform all the management tasks relating to registering devices, managing push device subscriptions and delivering push notifications directly to devices or devices associated with a client identifier. access using the push-subscribe permission. A client with push-subscribe is a push target device, and it can manage its registration and any subscription for itself; it is not able to manage push registrations or channel subscriptions for any other device. The credentials presented, as well as containing the push-subscribe permission, must also authenticate the device itself. by using a normal Ably key or Ably Token but additionally including a deviceIdentityToken – a credential created at registration time that is used to assert the device’s identity – in a header in the request. Management of device credentials is performed by the client library, so unless the push admin API is being accessed directly using HTTP, the client application does not need to worry about managing device credentials. Ably can deliver native push notifications to devices using, amongst others, Apple’s Push Notification service and Google’s Firebase Cloud Messaging service. Native push notifications, unlike Ably’s channel based pub/sub messaging, do not require the device to maintain a connection to Ably, as the underlying platform or OS is responsible for maintaining its own battery-efficient transport to receive push notifications. Therefore, native push notifications are commonly used to display visual notifications to users or launch a background process for an app in a battery-efficient manner. Devices identified by the recipient details of the native push transport such as their unique registrationToken in the case of FCM, deviceToken in the case of APNS, or targetUrl and encryptionKey in the case of a Web device (experimental). This means is particularly useful when migrating to Ably with existing push notification target devices. 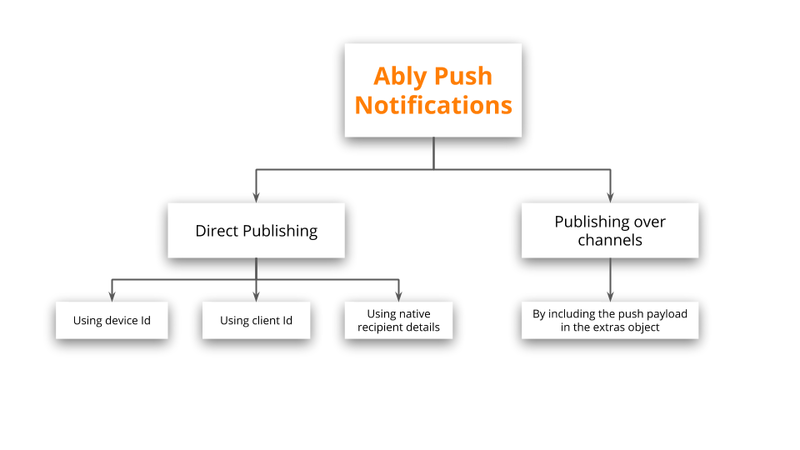 The model for delivering push notifications to devices over channels is intentionally very similar to how messages are normally delivered using Ably’s pub/sub channel. For example, a normal message published on an Ably channel is broadcast immediately to all realtime subscribers of that channel. When broadcasting push notifications on channels, however, the process is the same with the exception that the subscribers (devices receiving push notifications) are registered in advance using our API and the message itself must contain an extra push notification payload that specifies the optional visual format and optional data payload of the native push notification. Every device that will receive push notifications must activate itself with the local operating system or framework, and hook into the push notification services that the underlying platform provides. This functionality is platform-specific and can also vary considerably across not just platforms, but also across the push services that operate on those platforms such as GCM and FCM, both of which are available on the Android platform. The Ably client libraries aim to abstract away this complexity and platform-specific behaviour by providing a consistent API for device activation, maintenance of the device registration, and for subscription to Ably channels for receiving push notifications. Find out more about device activations and subscriptions. Whilst the realtime client libraries provide APIs for a device to activate itself (via client.push) and subscribe for push notifications (via channel.push), those APIs are intentionally limited to actions pertaining to the device it is run on. Find out more about the push admin API. experimental support for modern W3C compliant browsers (this does not include Apple’s Safari browser). Get in touch if you want to use this. Publishes a push notification directly to a device or group of devices sharing a client identifier. See the push notification direct publishing documentation for more information. The callback is called upon success or failure to publish the push notification. When this operation fails, err contains an ErrorInfo object with the failure reason. A Deferrable object is returned from the method. On success, the registered success blocks for the Deferrable and any block provided to the method are yielded to. Failure to publish the push notification will trigger the errback callback of the Deferrable with an ErrorInfo object with the failure reason. On successful publish of the message, the onSuccess method of the CompletionListener is called. On failure to publish the message, the onError method is called with an ErrorInfo argument describing the failure reason. The returned DeviceRegistrations object provides functionality for registering, updating, listing and deregistering push devices. The returned PushChannelSubscriptions object provides functionality for subscribing, listing and unsubscribing individual devices or groups of identified devices to push notifications published on channels. This object is accessible through client.push.admin.deviceRegistrationsclient.push.admin.device_registrations and provides an API to register new push notification devices, update existing devices, deregister old devices, and retrieve or list devices registered to an app. Obtain the DeviceDetails for a device registered for receiving push registrations matching the deviceId argument, or the id attribute of the provided DeviceDetails object. Requires push-admin permission or push-subscribe permission together with device authentication matching the requested deviceId. On success, device contains the device registered for push notifications as a DeviceDetails object. On failure to retrieve the device, err contains an ErrorInfo object with the failure reason. On success, the registered success blocks for the Deferrable and any block provided to the method yield the device registered for push notifications as a DeviceDetails object. Failure to retrieve the device will trigger the errback callbacks of the Deferrable with an ErrorInfo object with the failure reason. On successful publish of the message, the onSuccess method of the CompletionListener is called. On failure to get the device, the onError method is called with an ErrorInfo argument describing the failure reason. Retrieve all devices matching the params filter as a paginated list of DeviceDetails objects. Requires push-admin permission. an object containing the query parameters as key value pairs as specified below. On success, resultPage contains a PaginatedResult encapsulating an array of DeviceDetails objects corresponding to the current page of results. PaginatedResult supports pagination using next() and first() methods. On failure to retrieve the devices, err contains an ErrorInfo object with the failure reason. On success, the registered success blocks for the Deferrable and any block provided to the method yield a PaginatedResult that encapsulates an array of DeviceDetails corresponding to the current page of results. PaginatedResult supports pagination using next() and first() methods. Failure to retrieve the devices will trigger the errback callbacks of the Deferrable with an ErrorInfo object with the failure reason. Register a new DeviceDetails object, or update an existing DeviceDetails object with the Ably service. Requires push-admin permission or push-subscribe permission together with device authentication matching the requested deviceId. On success, device contains the newly registered or updated device as a DeviceDetails object. On failure to create or update the device, err contains an ErrorInfo object with the failure reason. On success, the registered success blocks for the Deferrable and any block provided to the method yield the newly registered or updated device as a DeviceDetails object. Failure to create or update the device will trigger the errback callbacks of the Deferrable with an ErrorInfo object with the failure reason. Remove a device registered for receiving push registrations that matches the deviceId argument, or the id attribute of the provided DeviceDetails object. Requires push-admin permission or push-subscribe permission together with device authentication matching the requested deviceId. The callback is called upon success or failure to delete the device. Note that a request to delete a device that does not exist will result in a successful operation. When this operation fails, err contains an ErrorInfo object with the failure reason. On success, the registered success blocks for the Deferrable and any block provided to the method are yielded to. Note that a request to delete a device that does not exist will result in a successful operation. Failure to delete the device will trigger the errback callbacks of the Deferrable with an ErrorInfo object with the failure reason. Delete all devices matching the params filter. Requires push-admin permission. an object containing the filter parameters as key value pairs as specified below. The callback is called upon success or failure to delete the device. Note that a request that does match any existing devices will result in a successful operation. On success, the registered success blocks for the Deferrable and any block provided to the method are yielded to. Note that a request that does match any existing devices will result in a successful operation. This object is accessible through client.push.admin.channelSubscriptionsclient.push.admin.channel_subscriptions and provides an API to subscribe a push notification device to a channel ensuring it receives any push notifications published in the future on that channel. Additionally, this object allows these subscriptions to be retrieved, listed, updated or removed. Retrieve all push channel subscriptions that match the provided params filter as a paginated list of PushChannelSubscription objects. Each PushChannelSubscription represents a device or set of devices sharing the same client identifier registered to a channel to receive push notifications. On success, resultPage contains a PaginatedResult encapsulating an array of PushChannelSubscription objects corresponding to the current page of results. PaginatedResult supports pagination using next() and first() methods. On failure to retrieve the channel subscriptions, err contains an ErrorInfo object which contains the failure reason. On success, the registered success blocks for the Deferrable and any block provided to the method yield a PaginatedResult that encapsulates an array of PushChannelSubscription corresponding to the current page of results. PaginatedResult supports pagination using next() and first() methods. Failure to retrieve the channel subscriptions will trigger the errback callbacks of the Deferrable with an ErrorInfo object with the failure reason. Retrieve a list of channels with at least one subscribed device as a paginated list of channel name String objects. Requires push-admin permission. On success, resultPage contains a PaginatedResult encapsulating an array of channel name String values corresponding to the current page of results. PaginatedResult supports pagination using next() and first() methods. On failure to retrieve the channels, err contains an ErrorInfo object with the failure reason. On success, the registered success blocks for the Deferrable and any block provided to the method yield a PaginatedResult that encapsulates an array of channel name String values corresponding to the current page of results. PaginatedResult supports pagination using next() and first() methods. Failure to retrieve the channels will trigger the errback callbacks of the Deferrable with an ErrorInfo object with the failure reason. Subscribe a device or group of devices sharing a client identifier for push notifications published on a channel. On success, channelSubscription contains the newly subscribed or updated push channel subscription as a PushChannelSubscription object. On failure to create or update the channel subscription, err contains an ErrorInfo object with the failure reason. Unsubscribe a device or group of devices sharing a client identifier from push notifications on a channel. Requires push-admin permission or, in the case of a subscription associated with a given deviceId, push-subscribe permission together with device authentication matching that deviceId. The callback is called upon success or failure to unsubscribe. Note that a request to unsubscribe or remove a subscription that does not exist will result in a successful operation. Delete all push channel subscriptions matching the params filter. Requires push-admin permission. A DeviceDetails is a type encapsulating attributes of a device registered for push notifications. Secret value for the device. An PushChannelSubscription is a type encapsulating the subscription of a device or group of devices sharing a client identifier to a channel in order to receive push notifications. A static factory method to create a PushChannelSubscription object for a channel and single device. A static factory method to create a PushChannelSubscription object for a channel and group of devices sharing a client identifier.